A new app from Disney, inspired by the short film, Blank: A Vinylmation Love Story has been released. 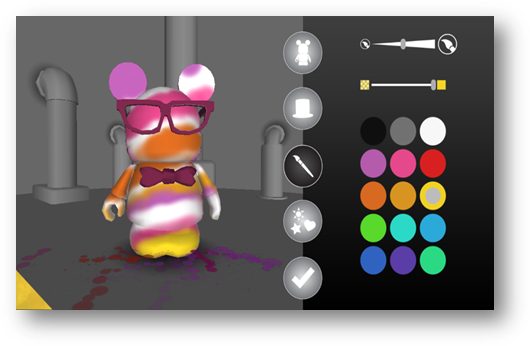 This app lets you create your very own virtual Vinylmation character. You start with, what else, a blank character. You can choose from either a male or female character. You can then take that character and color them in according to your style and imagination or choose from some pre-made looks. Your Vinylmation figure can also get accessories and more. Once you have created your Vinylmation character you can save the image to your device, either iOS or Android. You can read more about the app below. My daughter has played with it and she really enjoyed making all sorts of colorful characters. Building on the success of the recently released stop-motion animated film “Blank: A Vinylmation Love Story,” the new Vinylmation: Create Your Own app lets fans express themselves by designing virtual Vinylmation figures. After selecting a 3D Mickey or Minnie Mouse figure to decorate, users can experiment with paint, accessories and decal patterns. Completed creations become a part of the user’s personal collection and can also be exported to the device’s camera roll. Vinylmation: Create Your Own is available for free on iOS and Android. You can also download “Blank: A Vinylmation Love Story” for free from Google Play. Tweet an image of your Vinylmation: Create Your Own design @DisneyInteract using #BlankandBow for a chance to win a “Blank: A Vinylmation Love Story” prize-pack and be featured on the Disney Interactive blog!